Cal Crutchlow and John McPhee jet into Texas this weekend chasing at least a repeat of their podium finishes at the last round, in the Red Bull Grand Prix of the Americas in Austin on Sunday. Isle of Man based Midlander Crutchlow finished third on the LCR Honda in the MotoGP™ race in Argentina and faces the third round of the Championship with renewed confidence after finishing behind the Movistar Yamaha pair of Maverick Vinales and Valentino Rossi two weeks ago. His best result in Austin is fourth in 2013. Twenty-two-year-old Oban – based Scotsman McPhee has hit the ground running on his debut season in the new British Talent Honda team. He’s finished second in the opening two rounds behind 19-year-old Spaniard Joan Mir and is ready to push on to his second grand prix victory in the 18 lap Moto3™ race on Sunday round the 3.426 miles Circuit of the Americas. Gloucestershire’s Scott Redding has made an equally impressive and consistent start to his MotoGP season. Riding the Octo Pramac GP16 Ducati the former 125cc and Moto2™ grand prix winner is fourth in the Championship after finishing seventh and eighth in the opening two rounds in Qatar and Argentina. Oxfordshire’s Bradley Smith scored his first point of the season in Argentina and together with team-mate Pol Espargaro the KTM factory team’s first ever MotoGP points. Again they race into the unknown with the Austrian team at a circuit they have never competed at in a MotoGP race or test. Lincolnshire’s Sam Lowes is one of two British winners at Austin. He won the 2015 Moto2 race and needs some points on Sunday after a difficult start to his MotoGP career on the Gresini Aprilia. He was a lot happier in Argentina despite finally being side-lined with a gearbox problem. The other British winner was Danny Kent in the Moto3 race two years ago. It’s been tough start to the Moto2 season for the Wiltshire rider who crashed out a couple of weeks ago in Argentina. • In total, there have been 29 previous Grand Prix events hosted in the USA: Daytona – 2, Laguna Seca – 15, Indianapolis – 8 and Austin – 4. • Marc Marquez has won on each of the eight occasions that he has raced in the MotoGP class in America; four times at Austin, three times at Indianapolis and at Laguna Seca in 2013. Only once in these eight appearances in MotoGP in America has Marquez not been on pole; at Laguna Seca in 2013 when he qualified in second place on the grid behind Stefan Bradl. • The only riders currently competing in the MotoGP class who have won in the class at any of the American circuits are: Valentino Rossi, Dani Pedrosa, Jorge Lorenzo and Marc Marquez. • Ducati have had one rider finish on the podium in Austin for the last three years: Andrea Dovizioso was third in 2014 and second in 2015; Andrea Iannone was third last year. • Jorge Lorenzo’s second place finish last year is the best result for a Yamaha rider at the Austin circuit. • Maverick Viñales finished fourth at Austin last year, one place ahead of team-mate Aleix Espargaro. This was the first time since the San Marino Grand Prix in 2007 that Suzuki had two riders finish in the top five places. • All twelve podium finishers in the four previous MotoGP races held at Austin have been riders from either Spain of Italy. • The winners of the last three Moto2 races in Austin are now competing in the MotoGP class: Alex Rins, Sam Lowes and Maverick Viñales. The only other rider to win a Moto2 race in Austin is Nico Terol, at the first visit to the circuit in 2013. • The three riders who finished on the podium in the Moto2 race last year in Austin (Rins, Lowes and Zarco) have all moved up to race in the MotoGP class in 2017. • Last year’s Moto3 winner in Austin, Romano Fenati, is the only rider who has won at the circuit who is competing in the Moto3 class in 2017. Can the three riders who have won the opening two grands prix of the season make it a hat trick of victories when the 2017 MotoGP™ World Championship flies into Texas on Sunday? Maverick Vinales, Franco Mordbidelli and Joan Mir won their respective races in Qatar and Argentina but face a very different challenge in the Red Bull Grand Prix of the Americas in Austin. Maverick Vinales, who has brilliantly won the opening two MotoGP rounds on his Movistar Yamaha debut, faces a head to head challenge with World Champion Marc Marquez. The Repsol Honda rider, who has yet to secure a 2017 podium finish, has never been beaten in Austin winning all four MotoGP races at the demanding 3.426 miles Circuit of the Americas. Valentino Rossi, Vinales’ Yamaha team-mate, has finished third and second in the opening couple of rounds and would love to go one better at the circuit where he crashed last year. While Rossi trails his team-mate by 14 points in the championship Marquez knows that nothing short of a victory will suffice to close the massive 37 point gap between himself and his fellow Spaniard. There are a number of top riders looking to get back to points scoring ways after disasters in Argentina. The factory Ducati duo of Andrea Dovizioso, who has a couple of Austin podiums and Jorge Lorenzo, who was second last year, both crashed out. Andrea Iannone, who was replaced by Lorenzo at Ducati and who finished second last year, has crashed on both his Ecstar Suzuki appearances. Dani Pedrosa was another faller in Argentina leaving the way open to the consistent points scores to climb the championship table. Scott Redding on the Octo Pramac Ducati is fourth, Jonas Folger an impressive sixth on his Monster Tech3 Yamaha MotoGP debut season and last year’s Assen winner, Australian Jack Millar seventh. Then you have to throw into the mix in the 21 lap race the riders who crashed out in Qatar but fought back strongly in Argentina. Heading the list is Cal Crutchlow who was third riding the LCR Honda followed by Alvaro Bautista who was fourth on the Pull and Bear Aspar GP16 Ducati. Moto2™ World Champion Johann Zarco led on his MotoGP debut in Qatar before crashing, but fought hard for fifth in Argentina, is one place ahead of the impressive Aleix Espargaro on the Gresini Aprilia. Italian Franco Morbidelli won his first Moto2™ grand prix and took his first pole position in Qatar and has not looked back. The EG 0.0 Marc VDS rider made it two in a row in Argentina despite the challenge of his team-mate Alex Marquez who crashed out. Portuguese star Miguel Oliveira gave the new KTM team a superb second place with Mr Consistency Tom Luthi in third. Takaaki Nakagami will chase a repeat of his Qatar podium after an Argentine crash, with Italian Lorenzo Baldassarri chasing a podium after his fourth last time out. Moto3™ World Champion Brad Binder misses out after a plate came loose in his previously broken left arm. Nineteen-year-old Spaniard Joan Mir has been in brilliant form to win the opening two Moto3™ races riding the Leopard Racing Honda. In Argentina he started from 16th on the grid to win from John McPhee who has also started his season in superb style. Riding the British Talent Honda, he’s finished second in both races with Spaniard Jorge Martin third both times on the Del Conca Gresini Honda. There are a bevy of riders ready to challenge the leading trio headed by former Austin winner Romano Fenati. John McPhee and Scott Redding chase repeat performances at the second round of the MotoGP™ World Championship in Argentina on Sunday. In the opening Qatar round Scotsman McPhee was a superb second in the Moto3™ race while Gloucestershire’s Redding’s seventh place in the MotoGP race was a tremendous morale booster before they arrive at the 2.986 miles Termas de Rio Honda circuit, which is situated 500 miles north – west of Buenos Aires. After a difficult time in pre-season testing on the Octo Pramac Ducati, Redding hit top form in Qatar and finished under ten seconds behind race winner Maverick Vinales. In the same Qatar race, Oxfordshire’s Bradley Smith made his factory debut on the new KTM. Together with team-mate Pol Espargaro he was delighted to finish the first ‘proper’ grand prix for the team and will be moving on to finish in the points at the next two races in Argentina and Austin two weeks later. Moto2™ Grand Prix winner Sam Lowes also finished the race on his MotoGP debut. The Lincolnshire rider gained valuable experience on the Gresini Aprilia and will be encouraged by the sixth place finish of his team-mate Aleix Espargaro. Qatar was a tough weekend for double MotoGP grand prix winner Cal Crutchlow. After a big crash in practice from the LCR Honda, he crashed again in the early stages of the race. The Isle of Man based Midlander bravely remounted but fell again when the throttle stuck open. He will be seeking a change of fortune at the circuit where he finished third two years ago. Oban – based McPhee gave the British Talent Honda team a tremendous debut in Qatar in an eight rider race for victory under the floodlights. It was his first grand prix since a serious injury sustained at the Australian Grand Prix in November last year and the 22-year-old can expect another big Moto3™ fight in the 21 lap race on Sunday. Wiltshire’s Danny Kent was 13th in the Qatar Moto2 race after impressing during practice. 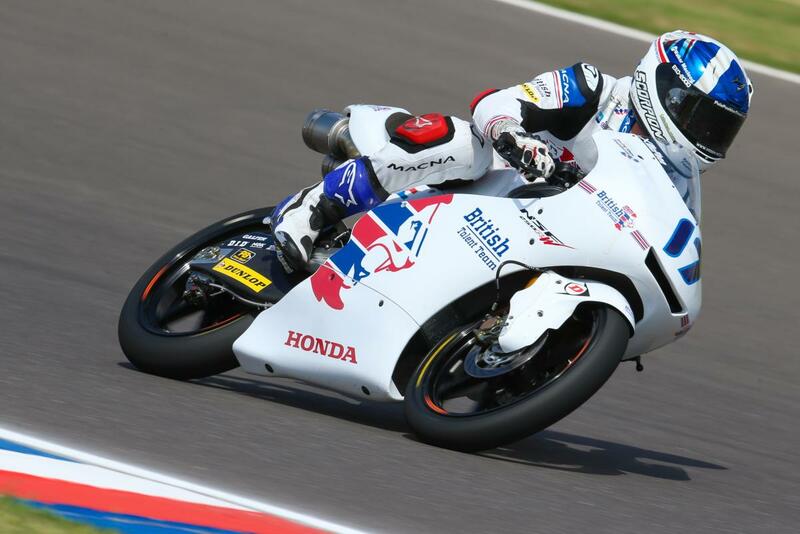 He returns to the Termas de Rio Hondo circuit where he won the Moto3 race two years on route to the world title. 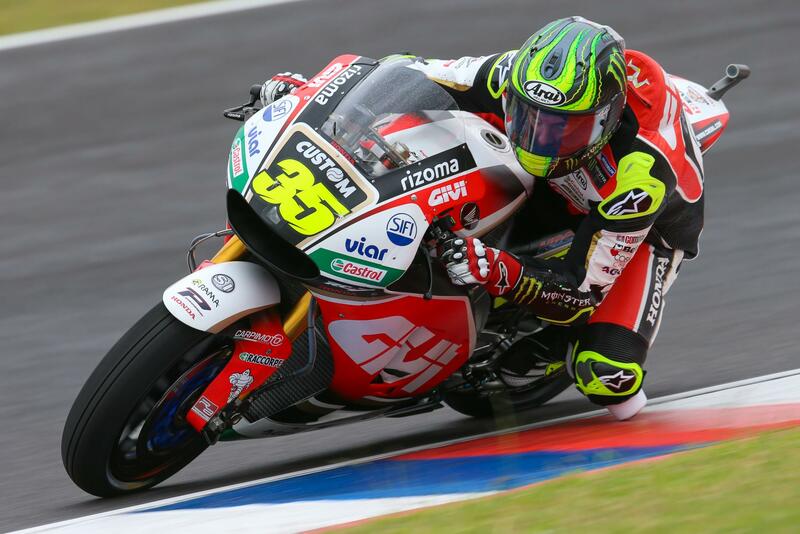 • This year’s event at the Termas de Rio Hondo circuit is the 14th motorcycle grand prix to be held in Argentina. • The first Argentinean GP took place in 1961 and was held in Buenos Aires; the first time that a grand prix had taken place outside of Europe. Not all of the top riders attended the event and the 52 lap, 203 km, 500cc race was won by home rider Jorge Kissling (Matchless) from fellow countryman Juan Carlos Salatino (Norton). • This is the fourth year that the Argentinean GP has taken place at the Termas de Rio Hondo circuit. All of the ten previous grand prix in Argentina had taken place in Buenos Aires, the last of which was in 1999. • The only current full-time grand prix rider who has raced in grand prix at the Buenos Aires circuit is Valentino Rossi, who won the 250cc race in 1998 & was third in 1999. • Marc Marquez has twice won the MotoGP™ race in Argentina from pole position – in 2014 and 2016. He was also on pole in Argentina in 2015, but crashed when battling for the lead. • The only rider other than Marquez to win a MotoGP race at the Termas de Rio Hondo circuit is Valentino Rossi, who won on the 2015 race after starting down in 8th place on the grid. • Andrea Dovizioso’s second place finish in 2015 is the only podium finish for a Ducati rider in Argentina. • The best result for a Suzuki rider at the Termas de Rio Hondo circuit is seventh with Aleix Espargaro two years ago. • Stefan Bradl finished seventh last year in Argentina which was the best result for Aprilia the MotoGP class since Noriyuki Haga finished seventh at the British Grand Prix at Donington in 2003. • The three Moto2™ races that have taken place at the Termas de Rio Hondo circuit have been won by riders now competing in the MotoGP class: Tito Rabat in 2014, Johann Zarco in 2015 & 2016. In each of the past three years the Moto2 race winner in Argentina has gone on to take the world title. • Last year in Argentina Khairul Idham Pawi won the Moto3™ race – the first Malaysian rider to win a grand prix race in any class. All we ask is more of the same please in Argentina on Sunday after a superb opening round of the 2017 MotoGP™ World Championship in Qatar. Twenty-two-year-old Spaniard Maverick Vinales fought off the challenge of veteran warhorses Andrea Dovizioso and Valentino Rossi in a fight to the flag in the 20 lap race. Vinales was making his Movistar Yamaha debut and can expect even more challengers around the 2.986 miles Termas de Rio Hondo circuit situated some 500 miles north- west of Buenos Aries. Rossi, the winner two years ago and Dovizioso, second in that 2015 race will be joined by World Champion Marc Marquez who brought Repsol Honda victory in 2014 and last year, and his team-mater Dani Pedrosa. Marquez was fourth in Qatar after a wrong tyre choice but has a great record in Argentina. Dovizioso was set for another podium finish last year when he was knocked off by his Ducati team-mate Andrea Iannone two bends from the finish. Iannone left Ducati to replace Vinales at Ecstar Suzuki and crashed out in Qatar while contesting the podium. His new team-mate Alex Rins, who was an impressive ninth in Qatar on his MotoGP debut, could miss the race after breaking his ankle in a motocross training crash. Three times MotoGP World Champion Jorge Lorenzo made a disappointing Ducati debut finishing 11th in Qatar but he returned to test in Jerez with team-mate Dovizioso and will be pushing for podium finishes and race wins by the time we reach Europe. There were some stand out performances in Qatar and the likes of Aleix Espargaro who brought Aprilia their best ever MotoGP result in sixth, Scott Redding, Jack Miller and rookie Jonas Folger would be delighted with a repeat showing. Double Moto2™ World Champion Johann Zarco, Folger’s team-mate at Monster Tech 3 Yamaha, made a sensational start to his MotoGP career leading the established stars until he crashed. The Frenchman returns to the circuit where he’s won for the last two years. Other fallers looking to open their account are Cal Crutchlow, who crashed twice from the LCR Honda and Alvaro Bautista who was so impressive in pre-season testing. Italian Franco Morbidelli stamped his mark on the Moto2™ Championship with his maiden victory in Qatar riding the Marc VDS machine. With four of the leading Moto2 riders joining MotoGP, the race gave an indication of what to expect with Tom Luthi and Takaaki Nakagami on the podium. There were impressive performances by Miquel Oliviera riding the new KTM into fourth place in front of former Moto3™ World Champion Alex Marquez. Last year’s surprise Moto3 winner in Argentina, Khairul Idham Pawi, makes his second Moto2 appearance after a disappointing 28th in Qatar. Nothing changed in Moto3 with the first eight Qatar finishers separated by less than nine tenths of a second. Joan Mir pulled off a superb victory over John McPhee and Jorge Martin and the 21 lap race on Sunday could be a similar last bend shoot –out.